E1316 pulls into Rabat Ville with a service to Fes on 6th January 2017. Both the locomotive, based on the SNCF BB7200 and the Corail coaches which it pulls are typically French. 06/01/2017. No trains today- unless you care about the journey to Stanstead airport. It was a leisurely fight with Ryanair to Rabat. Despite not choosing to pay for an allocated seat I was given a window right near the front of the plane. During the course of the flight both of the two people sitting in my row got up and disappeared... I did't think I smelt particularly bad!? Having arrived at Rabat there was a bit of a faf with getting money as neither ATM at the airport liked my card (I think it was my card rather than the ATM's at fault) so my first dinar was exchanged from my sterling at one of the money exchanges- I would have to hope my card would work in the morning! Transfer to the city was by the airport bus for 20 dinar (about £1.80)- first impressions of Morocco were as a modern 'civilised' country, then we passed two lorries massively overloaded with the most hay bails I have possibly every seen! I stayed at the Rihab Hotel which was well located and fine. At first glance very nice actually, but the bathroom turned out to be ropey and the water turned out to be luke warm at best. As it was well dark by the time I arrived dinner was at a chain chicken restaurant around the corner, all very nice but I didn't really want the football on loudly booming across the whole place. I asked for the WiFi code and the waiter smiled and said 'no'... not sure what that was all about! trains between Cassablanca and Kenitra (plus some to Fes). After breakfast I headed to Rabat Ville station, about 10 minutes from the hotel. I purchased a ticket for the short leap to Rabat Agdal partly to score a loco for the 5 minute hop but also to gain access to the station. I used the automatic ticket machines which do have an English option but always seem to be out of change. Expecting hassle with photos I made my way to the end of the platform out of the way for a few snaps, about 50% of the trains here are the new-ish double deck units, the other half being electric loco hauled. It generally seemed that the lower numbers, two digit trains were units with the three digit trains being 'grand lignes' locos and stock. Shadows were difficult in the lowish winter sun so I boarded the first loco to arrive E1412, one of the new Alsthom Prima II's to Agdul. I have to say, for a modern loco I really like the Prima II, especially in ONCF's orange and grey. 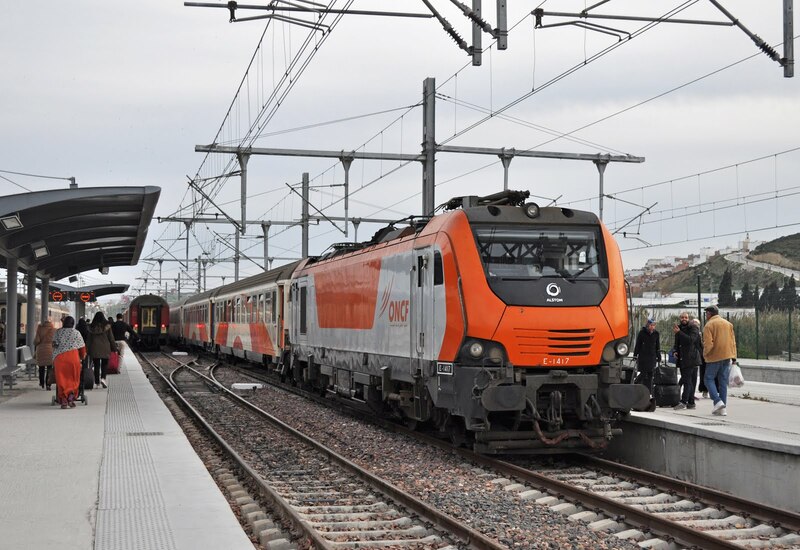 My first ride on ONCF was with E1412 a very smart Alsthom Prima II. I spent around 90 minutes at Rabat Agdul during which a further 3 loco hauled trains were seen, firstly a southbound train with old Hitachi E1262 and secondly a northbound with Alsthom 'Nez Cassis' E1314 - a very French looking train once you couple it up with a typical train of Corail coaches. Finaly I left Agdul on E1408 heading back to Rabat Ville. I really needed to ride some of the older classes but I had a few shots and had not been accosted for photography at all. locos definitely have some character. E1262 stats at Rabat Agdul 06/01/2017. I spent the early afternoon wandering around Rabat, though the Medina and out to the coast. An absolutely fascinating city by all accounts and a great place to while away a few hours. It's an odd mix of everything with the medieval Medina butting up to the modern tramway (opened 2011) with its Alsthom Citadis trams! Before I had got bored of the place it was time to head back to the hotel, pick up my bag and head to the station for my train onward to to Fes. I had bought my tickets at the station earlier, this time from the counter as I wanted to break my journey in Kenitra in order to score another loco. This was no problem and with a bit of French and English I had my tickets no problem. I was told that despite having a train number printed on the ticket I could take any train that day with my 2nd class fare. The train rolled in with E1316- Brilliant- not another modern Prima! The train was very busy but I did find a seat with a window in an open coach. Not everyone was so lucky. Kenitra turned out to be a building site but I didn't have too long here. Shortly after my arrival E1411 pulled in. Soon there was a flurry of activity around the front of the loco so I headed down to see what was going on- At some point earlier on its run it had clearly hit something large enough to smash and shatter the windscreen. No problem though- some sticky back plastic was quickly found and a makeshift repair made. Now I couldn't see a driver back home taking that forward in service, but off it went! My chariot forward pulled in as E1404 where I found a nice seat in a compartment for the journey on to Fes. The area around Rabat/Kenitra is seeing heavy investment as it will take the TGV's off the high speed line when it opens- part of this upgrade involves fencing in the entire railway with large concrete 'upside down T' sections which will make any lineside photography very ugly- and also doesn't entirely seem to keep the locals out as I saw several men vaulting over them. The line is rather flat and boring until reaching somewhere near Sidi Kacem where the landscape becomes more mountainous, and it god dark. receives attention to its windscreen while it is paused at Kenitra. On arrival at Fes there was the reassuring sound of a diesel heading east in another platform- I wandered over for a look and hopefully a photo, though the light was awful. I was quickly ushered away. The station staff clearly didn't want me anywhere near that diesel. Gare du Fes is located in the new town, so I would need to make my way to the Medina for my hotel. Out of instinct I told all the taxi hawkers to go away before realising that what I actually needed was a taxi. I paid 40 dinah to reach the beautiful Riad Ibn Khaldoun, where upon arrival I discovered a taxi should have cost me 15-20 dinah. I would highly recommend this Riad to stay in- my room was stunning and it had heating (which is not a given for Morocco in winter). It was dark now so I went for a walk around the local area for the medina before finding somewhere for dinner. I rather suspect I was put upstairs in the 'foreigners room' for dinner as non-Moroccan parties were scattered sparsely around tables generally eating spaghetti bolognase. The restaurant was cold and sadly lacked atmosphere- but I can't complain at my giant bowl of cous-cous with lamb and with hindsight I don't think I paid too far over the odds for it at 100 dinah. In an unusual change for these trips I was in bed at a reasonable hour. 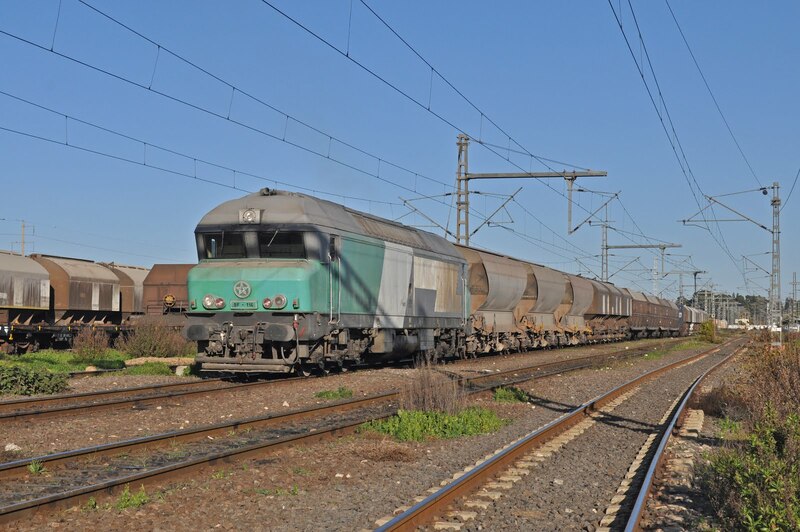 stock which has arrived at Fes to form the 10:45 to Beni Nsar Port. 07/01/2017. Breakfast was traditional Moroccan breads and things, but nice enough. Now if the exquisite room wasn't the best thing about this Riad then the view across the Medina had to be- absolutely stunning, and what a city Fes is! Anyway... on to the trains. I found a taxi no problem for 20 dinar back to the station and purchased my ticket to D'Oued Amlil on the line towards Ouidja. Train services are very limited with only 3-4 per day and this seemed to be the best place for a run of about 2 hours out and back. Having left plenty of time, as I don't trust taxis, I had about an hour on the station. I was watched quite closely but nobody gave me any grief until 5 minutes before my train departed at 10:45 for Beni Nsar Port. Two trains had departed west in this time with E1262 and E1416. Soon after DH363 arrived with stock for another westbound departure (which I think left with an E1300). Shortly after newer DH411 appeared light engine, DH364 also departed west with a freight, but a photo was not possible as the yard is behind a fence. Now which loco would work my train (which arrived from Casablanca with E1258?). DH363 shunted off a coach, and then DH411 backed on, a shame- I wanted the old one! DH430, one of the newer batch of locos in the revised ONCF colours departs from Gare D'Oued Amlil for Fes. Just time for a quick photo of DH363 as we pause at Gare Ain Sbit. It was a good run though we lost a little time for no apparent reason. I had a comfy seat in a Corail compartment again. On arrival at D'Oued Amlil there should have been a -2 onto a train back to Fes. I had figured as we were on single track it might make despite our 5 minute delay and it did. It was however never the plan to take it, especially as it had another of the newer locos, DH430. I did have time for a nice picture of it leaving though. Around an hour behind this train was another, one of very few occasions where you don't get stranded for hours. This gave me time to buy my return ticket, get some lunch (BBQ meat and bread- straight off the carcass for 50 dinar, probably a hugely inflated tourist price). I had vaguely hoped that a nice eastbound freight might turn up during my lay over. Of course it didn't, but I did find a nice spot to photograph my train arriving and then to leg it to the station to jump on. This worked very well and one of the older locos DH373 appeared for the full sun shot. I had an excellent run back with the loco and the remains of my lunch in a lovely old red-faux leather ex SNCF compartment. I had also figured by this point that the Corail doors would open while on the move... that was the answer to hearing the loco within the air-con's then! There was even time for a short photo stop at Gare Ain Sbit despite slightly late running. The driver seemed to get out of the loco here so I asked the guard how long we had 'about 1 minute' - that'll do! I sneaked a couple of photos of the train on arrival at Fes but didn't want to outstay my welcome having already been told, very nicely, that I wasn't allowed to take photos. wearing it's former Fret SNCF livery. 07/01/2017. Then I saw it... The holy grail of Moroccan trains... there was a DF in the yard. It was instantly recognisable as one of the ex-French CC72000's as it was still in SNCF Fret colours- now how on earth was I going to get a picture? The yard is reasonably well fenced and walking along the tracks was not going to work here. Eventually I found an access point through the black migrant camp (they were rather surprised to see me walking through!). Expecting to get kicked out of the yard I waited for the opportune moment to get my photo, letting a triple headed freight (E1100 + E1300 + E1200) get away in the process. I got my photo- with a massive shadow across it and was then greeted by a member of railway staff... Somehow we ended up having a nice chat and having passed him a photo of an SNCF CC72100 on the Belfort line I left with a few more photos and a friendly wave from him and his colleagues- that worked ok then! DM614 was also in the yard (with a shadow across it). Wandering the Medina in Fes in search of dinner. The diversion to DF 116 had cost me valuable time and I now had a lot less time to be a tourist around Fes. I got another 20 dinar taxi back to town and knew that my first port of call after dumping my bag was the tannery. It was a really fascinating place and I'm sure I needed the belt (100 dinar) and rug (350 dinar) that I was coaxed into buying! On a positive however I didn't get lost, or bugged by touts and actually found that having spent next to all of my money wandering the Medina was much more fun- I wasn't going to be forced into buying anything I didn't need because I couldn't! I ended the evening in one of the food alleys which was also a lot less filled with tourists. I made friends with a few stallholders while I stood drinking a glass of freshly squeezed pomegranate juice. For dinner it was street food- a stall I had seen with a queue the night befor. Here I definitely didn't get ripped off- I had seen the person in front of me pay his 10 dinar and clarified that my sandwich containing some sort of fried potato, an egg and some red stuff would cost the same. As I was turning to leave the stallholder called out to me... I hadn't picked up my change! Well there you are- dinner for 6 dinar (about 50p)! It was an early night again and after some photographs of the city skyline by night it was time to bed down. work Tangier the train which followed behind my departure. I had really enjoyed my time in Fes, but it was time to move on such was my whirlwind schedule. Today I had to end up in Tangier and had planned a schedule involving a couple of trains to score a few more locos, and maybe find some DF's in yards. My first train with E1260 took me to Meknes on the 09:40 departure to Casa Voyages. I had paid for a 1st class ticket for this part of the journey as it was cheap enough I could and would avoid any issue if the train was particularly busy. I found a nice compartment to myself and went to try the window to see if it was locked. It wasn't however as I went to open it I discovered another problem. It didn't stop at the angle it usually would and very soon was open to 270 degrees and a moment later was attached only to my hand and not the coach! I'd better put that back quickly... unfortunately it didn't really fit. Maybe it was like that before I thought as I watched it wobble in the frame. After a short while of unease I moved away from the middle seat convinced that it would blow in at the first tunnel. I didn't need to wait that long as 30 seconds after moving a train passed and that was enough- Bang! and the window was on the floor where I had just been sitting. I thought it prudent to let somebody on the train know, and the trolley attendant had just passed. He didn't seem interested at first to my 'problem finetra' but when he walked back past my compartment the scene was greeted with an 'Ooh la la!' so maybe it was an issue afterall! By the time the train had reached Meknes the travelling fitter was attending and I had been very apologetically moved to another compartment! At Meknes a E1300 was departing with a mixed freight as I arrived and there was an ONCF DF in the yard but it was totally inaccessible, especially given that the Tangier train (09:55 ex Fes) was shortly behind, the earlier train having left nearly 15 minutes late for no apparent reason. The second train had been observed with an E1400 the previous day but it was nice to see another oldie in the form of E1254 in charge. Given it was one of my better photos of the trip it is probably no wonder that I didn't take up the option to delete this photo! E1302 waits with a southbound at Sidi Kacem with a train mostly formed of old liveried Corail coaching stock. This was formerly the point where electric locos gave way to diesels heading north to Tangier. 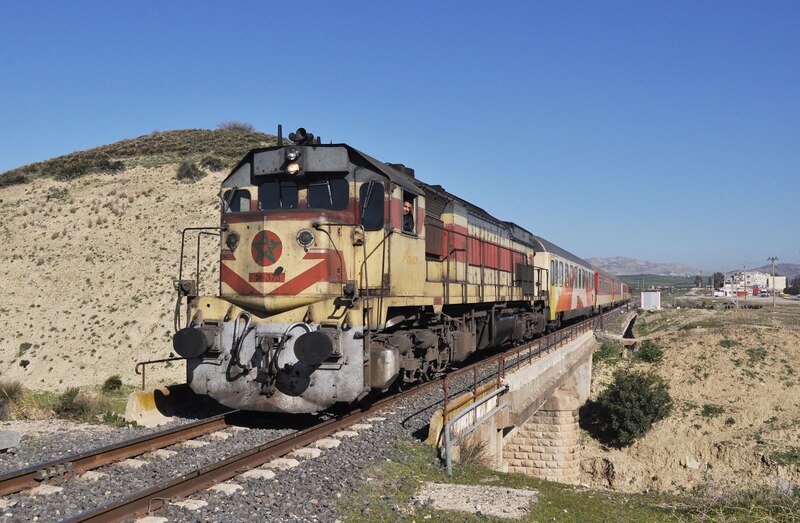 Since electrification in 2011 trains have continued north to Tangier with electric traction. 08/01/2017. Next stop was Sidi Kacem where our train was scheduled to lay over for around 30 minutes, quite significantly reduced because of our delay. I can only assume the timetable has not been re-cast since locos used to be exchanged here for the diesel run to Tanger before the wires were put up? In the other platform was a very well lit E1302 heading southbound. I popped over for a picture but before it departed was ordered not to take photos by the station staff. The driver didn't look best pleased either (all others had been super friendly) and I was advised that I 'should delete the picture'. As this was only advice and not an order I obviously didn't (it's probably my best shot of an E1300 as well)- but I did retreat back to my own train without taking any more! I had a plan to change again at Mechraa Belksiri as there was another Tangier service 90 minutes behind mine (and I still wanted another E1300)- I had also worked out that there should be two southbound trains passing which would be good for the sun. I eventually found a spot which was nothing more than 'ok' for the first of these trains which eventually turned up about 35 late with E1256. The second I had not seen before my cut off to head back to the station for my own train- It was the right decision to give up on it as it was 45 late, and had an E1400 at the helm. 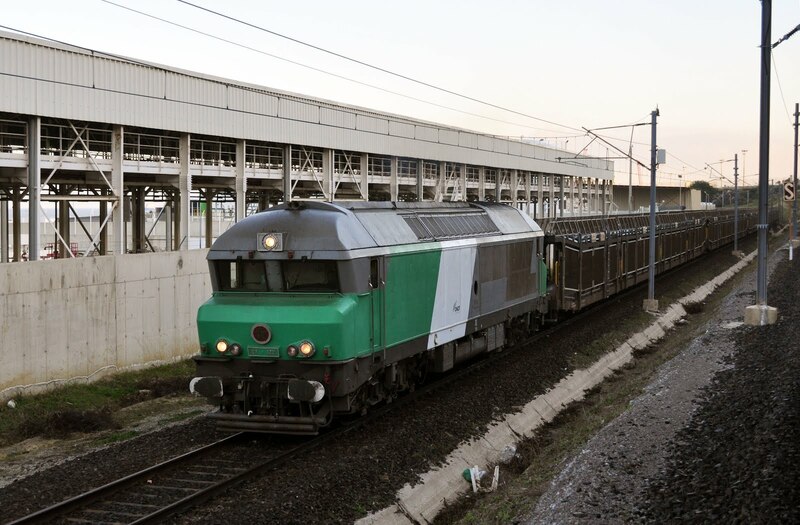 It passed the station as I was boarding my own train north, with E1417. For the sake of 1 mediocre photo and another E1400 I'm not sure the 90 minute stint had been worth it! at Tangier Ville. Much construction is taking place here. Arrival into Tangier Ville was shortly before nightfall and revealed another DF for sight with DF 120 in the yard opposite the stored TGV's. There is a lot of evidence of high speed line construction in this area but also much evidence that it is a way off yet. While the latest opening date of 2018 isn't impossible I'm not convinced it will happen myself. I counted 6 complete TGV Duplex sets in the new depot, some of which have now been there since 2015. It cannot be denied that the High Speed line will reduce journey times and thrust the rails to the forefront of Morocco's economy but like many I do question whether it is the best use of money, the project seeming slightly out of place with much of the character of the country. Tangier Ville station is another building site, with the station building some 100m away from the tracks connected by a temporary shelter. Once TGV services start running this will be the grand northern terminus. It is a pleasant 30 minute walk to the old town, mostly along the sea front (another construction site) with views of the Spanish mountains across the Straight of Gibralter. Some of the TGV's at the new depot at Tangier have already been standing idle for over 2 years. The High Speed line is currently expected to open in 2018. - Track has not yet reached Tangier. 08/07/2017. I took a wrong turning looking for my hotel the basic, but adequate (and cold) Hotel Mamora. A local stopped me trying to give me cards to hotels and as I was shoeing him away I realised one was the very one I was looking for! He got an adequate tip but wanted me more for showing me the way. Not having any clue where to go for dinner I consulted trip advisor and ended up with a very nice meal which while the most expensive of my trip (130 dinar for two courses) I didn't feel I'd been overcharged for. I spent another hour or so wandering the Medina in Tangier and again not getting too lost before heading back to the hotel. I would need a taxi back to the station in the morning as I had already purchased my tickets for the 07:15 train to Tangier Port Med. The hotel was happy to book this for me for 100 dinar- I sincerely hope the guy at the desk had got confused as it should only cost 15! I did try to point this out and eventually decided to try my luck hailing my own cab in the morning. 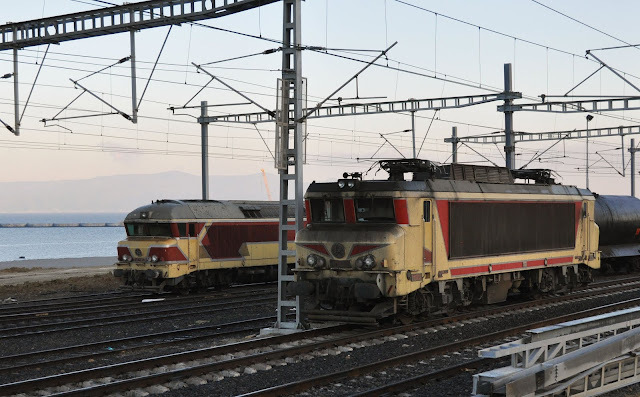 Finally- a DF in ONCF colours- DF105 and E1351 show off both the French 'Nez Cassis' classes in use in Morocco. I had to skip breakfast but had brought some provisions the night before. Getting a taxi for 15 dinar from the road was no problem and I was at Tangier Ville in plenty of time for my train. As ever I showed my ticket to gain access to the platform and was asked if I wanted to know the platform number in French or English. It really didn't matter to me and turned out to be irrelevant anyway as platform 4 which I was directed to was full of the 07:25 train to Casa Voyages. On platform 2 was a more likely candidate, a loco, one Corail and generator coach which the crew confirmed was the 07:15 to Tangier Port Med. I had read that this train was very lightly loaded and while the passenger numbers must have been in double figures I did keep a compartment to myself for the whole of the 1 hour scenic ride behind E1310. Having heard of other enthusiasts luck with DF's on the branch I kept my eyes peeled (and the coach door open) every time we approached a yard. 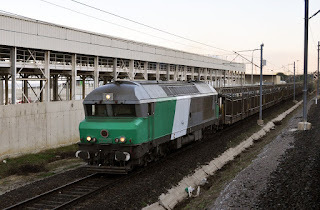 I was rewarded on the final approach to the port with DF 105 stabled in a yard and finally a photo of DF 120 (ex CC72003 and again in SNCF Fret livery) pulling a train out of the car loading terminal in the docks themselves. DF120 hauls an empty car train out of Tangier Port Med. If you are only interested in the trains you can stop reading at this point, however my journey was far from over. 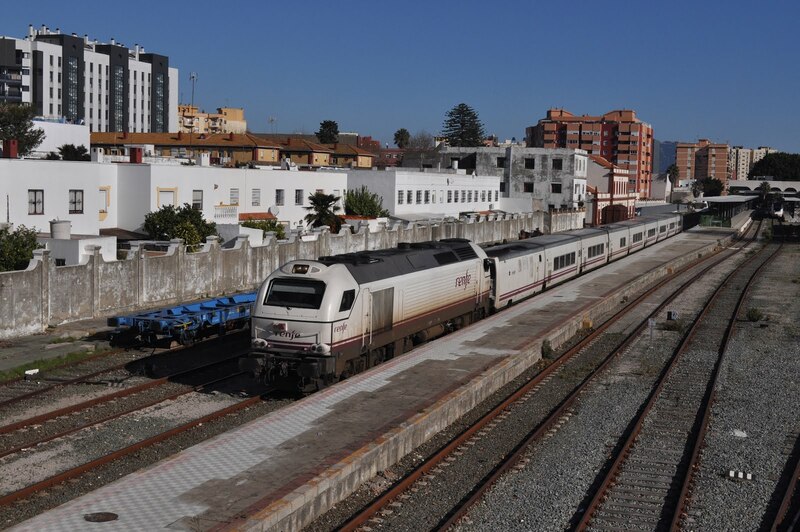 I hadn't pre-booked a ferry, in fact I was originally planning to take the FRS fast cat from the old port in Tangier town to Tarifa in Spain, but then I did discover the one daily train to Tanger Port Med which would put me on a boat straight to Algeciras. Unfortunately there was a long gap between my 08:15 arrival at the port and the next boat. One of the company rep's told passengers that their company would run the next boat at 10/10:30 (so 10:30 then). I checked and another boat was due to leave at 10, but as was pointed out to us, it was still out at sea on its inward voyage. To be fair to the guy his boat wasn't the first to leave when it did at 11:00, but the other boat was only 10 mins in front and at 23 euros I didn't feel too hard done by. It was however abundantly clear that I wasn't going to get a photo of the train departing Algeceras at 11:45 as I had hoped. My boat the Nova Star was well appointed and had a nice outdoor area where I spent the whole crossing taking in the fading view of Africa and passing Gibraltar before we turned left into Algeceras. Leaving Morocco from Tangier Port Med by boat. Algeceras itself is hardly an idyllic Spanish town from what I saw but does boast a large dock complex. The station is about a 10 minute walk inland from the ferry terminal and sees several trains each day, the long distance ones being diesel loco hauled Talgo sets. I had long missed the 11:45 as now expected (also loosing an hour to the time change) but wasn't far off the 15:03 departure! I found a spot to view this and hoped that it would be the loco and stock in the station and not the unit with it's lights on. I had almost given up on the loco when 3 minutes before departure the level crossing went down and then to my almost shock the driver got in the loco, lights on, engine on and off it went! 334018 didn't sound bad either! The 15:03 Altaria Talgo service from Algeciras to Madrid gets underway behind 334018. 09/07/2017. Now it was time for me to rescue the heavily delayed itinerary for my day- heading across from the station to the bus depot to take the M-120 to La Lunea for Gibralta. It's more of a coach than a bus and costs 2.45 euro taking just under 45 minutes. Once at the end of the route it is a simple walk through the e-passport gates to get back into Britain- sort of! Gibraltar is a funny place, no less so from the fact that you must walk across an active runway to reach the town! I didn't initially find the main street having ended up in a residential area but once I did it was certainly time to find a pub and get a cider. It's very strange seeing common British brands among the local population, the majority of whom speak Spanish. Armed with a cookie from M&S it was back across the runway to make my flight back to Luton with Monarch. Walking across the runway with the Rock of Gibralta looking on. The flight was pretty full and due to being one of the last to board I had to take my turn at being one of the 'normals' faffing trying to get their small case into the overhead bin. Again I had been allocated a nice window seat without the £7 charge, though did have to suffer a couple next to me who clearly couldn't manage to do anything solo... having fed his girlfriend he even started reading her a story- I mean really!? Our final drama was on the tarmac at Luton where one passenger accused another of stealing his wallet, a situation handled phenomenally badly by both parties. Welcome back to Luton folks! As is often the case I then had the worst journey of the entire trip getting back to Waterloo- I hadn't realised there was a tube strike when I booked the flight! typical Moroccan style. Stations are clean and well appointed. I had wanted to visit Morocco for a very long time but somehow it had never quite made it to the top of my list. Of course I now wish it had while the DF's were still working passenger. That aside the country is still well worth a visit for it's trains and I'm sure I'll go back. The locos which do run are very pleasing and travelling on Corails is pleasant wherever you are in the world. Travel is very cheap as well, I used point to point tickets totaling 353 dinar (about £30) including one 1st class journey. Unfortunately very little freight was seen, and I'd be interested to hear from readers of their experiences- I'd like to catch some, was I just unlucky or in the wrong areas for much of the time (it was also a weekend)? Photography was not as big an issue as it could have been, though seemed to be totally hit and miss with some locations being find and others not. Either way nowhere felt like you would get away with loitering on the station for more than a couple of hours. Aside from the trains Morocco is a fascinating and beautiful country full of friendly people and I highly recommend a visit. DH373 approaches Gare D'Oued Amlil with the 08:40 Beni Nsar Port to Casa Voyageurs on 7th January 2017.